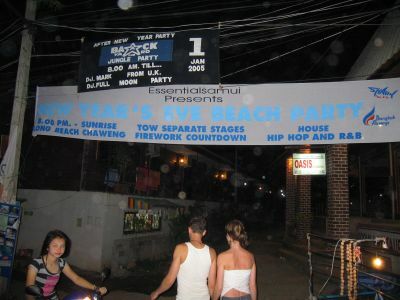 i went down to koh phangan, an island in the gulf of thailand, a backpackers paradise, for new year's eve. before i went out for the big celebration some thai dancers entertained the folks at my resort. zac and camilla getting ready for nye in a bar aptly named the warm-up bar. 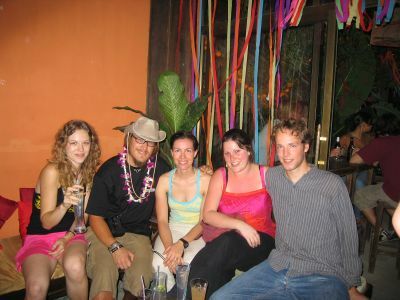 claire from france, me, dori from germany, niccola from england, and alex from france getting pumped up for midnight. 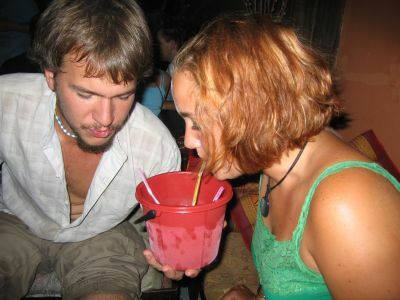 zac and camilla share a bucket. a bucket is evil. it's red bull, coke, and thai rum, mostly rum. they cost $3.75 and 10,000 brain cells. they taste good so you end up drinking 48 of 'em - and then the real cost kicks in - the hangover from hell. 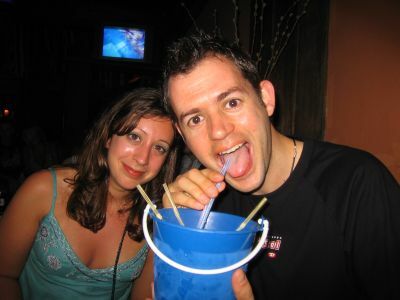 steve and angela from england enjoy a bucket. later in the night steve and i would be locked in a drunken hug on the beach when a professional-sized firework exploded on the ground and shot right in between us. 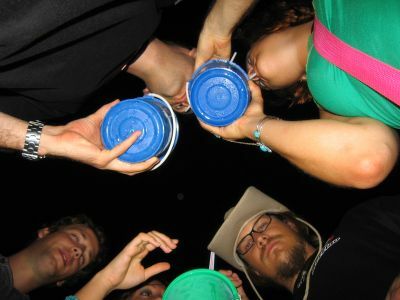 we dubbed ourselves "the chosen ones" and drank about 18 more buckets. each. i met dori and niccola in khao yai national park. 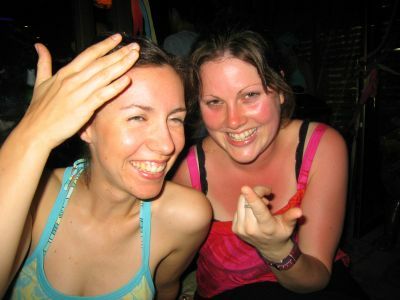 we were all headed to koh phangan for new year's and had a great time together. headed to the beach with the masses for the midnight eruption. 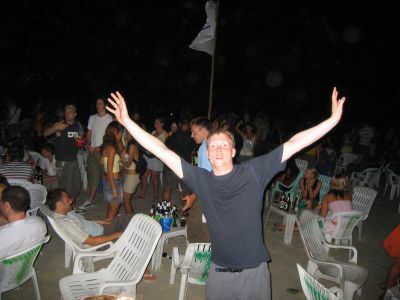 neil welcomes you to the chaos of the beach of koh phangan on new year's eve. a circle of buckets on the beach. 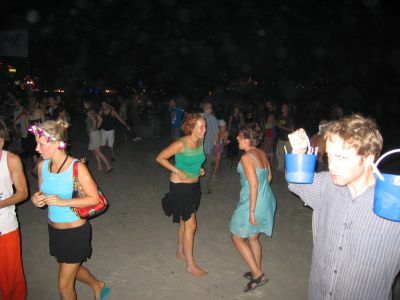 camilla and angela dancing on the beach, alex holding two brand new buckets. a self-portrait of a guy who wishes he was dead. 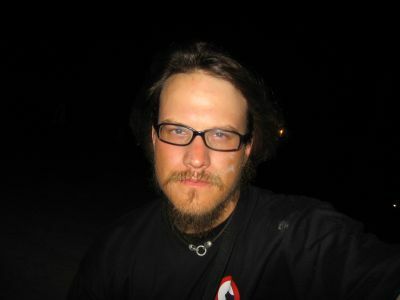 this is about 5:00 in the morning on the beach on 1.1.2005. i was hoping someone would come by and put a spike in my forehead. i swore off buckets forever and didn't have one again for 4 days.